4. Announcement: Chairperson, Donna Andries and legal counsel, Andrew Kolb met with OMV Commissioner, Karen St. Germain and her attorney and staff on March 28, 2018 at 3:30 PM to present the LULSTB 2017-2018 budget. The budget was accepted by OMV and they will be cutting a check tomorrow to the LULSTB for $450,000 for the 2017-2018 fiscal year. We will set up EFT payments to begin in July, 2018. NOTICE IS GIVEN that by resolution adopted on the 11th day of October, 2017, by the Louisiana Uniform Local Sales Tax Board, the Kolb Law Firm, LLC has been retained as special counsel to represent the Louisiana Uniform Local Sales Tax Board in constitutional law and other matters relating to sales and use tax law and approval thereof by the Attorney General for the State of Louisiana has been received. A copy of the resolution is available for inspection at the offices of the Louisiana Uniform Local Sales Tax Board. The Louisiana Uniform Local Sales Tax Board held its regular meeting at the LMA Building, 700 N 10th Street, Baton Rouge, LA 70802, on Thursday, April 12, 2018 at 10:00 am. The following board members were in attendance: Donna Andries, Amber Hymel, Tiffani Delapasse, John Gallagher and Mark West (Proxy for Roland Dartez). Absent: Scott Richard, Greg Ruppert, and Mike Ranatza. • Motion was made by John Gallagher and seconded by Tiffani Delapasse to move the planned Executive Session from the end of the meeting to the beginning in order to allow presentations to be made by participants in a timely manner. The motion passed unanimously and Executive Session was entered into at 10:16am. • A motion was made at 11:25am to end the Executive Session and proceed with the regular meeting by Tiffani Delapasse and seconded by John Gallagher. The motion passed. • Motion by John Gallagher, seconded by Tiffani Delapasse to approve the Board minutes of the March 15, 2018 Regular Board meeting. Item unanimously passed. • Motion by John Gallagher, seconded by Tiffani Delapasse to approve the Board minutes of the March 23, 2018 Special Meeting. Item unanimously passed. • Tiffani Delapasse motioned that Item #11 to receive proposals from prospective accounting firms to Item #3. The motion was seconded by John Gallagher and passed by the board. o Proposals for the Board’s Accounting/Bookkeeping Service needs were received from Faulk & Winkler, LLC and TWRU CPAs & Financial Advisors. Each proposal is available for public viewing at 203 East Plaquemine St., Jennings, LA 70546.  After the presentations and further review and discussion of the proposals, Tiffani Delapasse motioned to select Faulk & Winkler, LLC as the Accounting Firm of the LULST Board. The motion was seconded by Amber Hymel and passed unanimously. • A motion was made by Tiffani Delapasse and seconded by John Gallagher to publish a notice of legal counsel in the Board’s journal of record, The Advocate for one day. The motion was seconded by John Gallagher and approved by the Board.  NOTICE IS GIVEN that by resolution adopted on the 11th day of October 2017, by the LULST Board, the Kolb Law Firm, LLC has been retained as special counsel to represent the LULST Board in constitutional law and other matters relating to sales and use tax law and approval thereof by the Attorney General for the State of Louisiana has been received. A copy of the resolution is available for inspection at the offices of the LULST Secretary located at 203 East Plaquemine St., Jennings, LA 70546. • A motion was made by John Gallagher and seconded by Tiffani Delapasse to receive and approve invoices for legal fees from attorney, Andrew Kolb, for services previously rendered. The item unanimously passed. • A proposal for technology services for the Board was anticipated from Scout Designs, however the firm was not able to present any items to the Board and this item was passed over during the meeting. o It was determined however that Donna Andries and John Gallagher will reach out to various technology vendors for future proposals. • A motion was made by Tiffani Delapasse to amend the budget to reclassify $80,000 from Administrative Services to $60,000 Salaries & Wages and $20,000 to Employee Benefits. The motion was seconded by Amber Hymel and unanimously passed by the Board. o The item was added to the agenda. o Motion by Mark West to use the Fiscal Note of HB601 of the 2017 Regular Session as the range for the Executive Director salary. 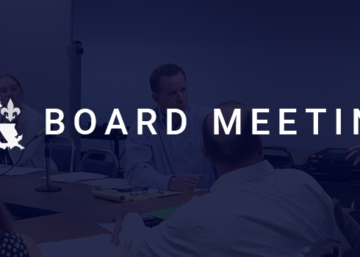  The board will create a spreadsheet and vote on a schedule and cap at the special meeting on April 27, 2018. • An announcement was made that Chairperson, Donna Andries and legal counsel, Andrew Kolb met with the OMV Commissioner, Karen St. Germain and her attorney and staff on March 28, 2018 at 3:30PM to present the LULSTB 2017-2018 budget. The budget was accepted by OMV and they will cut a check tomorrow, April 13, 2018 to the LULSTB in the amount of $450,000 for the 2017-2018 fiscal year. Donna Andries completed all paperwork necessary set up the LULSTB as a vendor through the Division of Administration and to receive EFT payments from the OMV, which will begin in July 2018. Donna Andries has also ordered checks for the Board account expenses. o Going forward any monies collected above the accepted budget will be held in escrow until the budget is completed for next year. The deadline to provide the 2018-2019 Budget is June 1, 2018.
o The Board will review and adjust the next year’s budget to consider any collections in excess of the original budget provided. There is currently not a mechanism in OMV’s collection system, or with the LULST Board that can refund excess to the taxing authorities, which warrants the necessity to adjust the budget and rate of collections going forward. • Mark West gave a Legislative Update to the Board on pending items that would be of interest to the Board. • An announcement was also made to make members aware the Status conference to determine the hearing date for current litigation will be held on April 19, 2018. • A special meeting was scheduled for April 27, 2018 at 9:00am in order to interview prospective applicants for the position of Executive Director. A second special meeting to interview the remaining applicants will be scheduled at a later date. Motion to adjourn by Tiffani Delapasse and seconded by John Gallagher and unanimously passed by board.